Carlton McCoy grew up in what used to be the murder capital of America; today, he oversees one of the country’s most rarefied wine lists. Here’s how he did it—and the age-worthy bottles that are his life’s work. You grew up in Anacostia, in Washington, DC—a pretty rough neighborhood, and not exactly wine central, right? No, Mad Dog 20/20 is more like the bottle you’d see there. It was a very dangerous place; I’m not going to be shy about that. When I was growing up it was the murder capital of the country. Going from there to wine director at Aspen, Colorado’s Little Nell hotel is a huge transformation. How’d it happen? How did your friends react? They’d just look at me, like, “You’re what?” But to me, “We’re going to go throw a ball around” sounded boring. “We’re going to peel potatoes,” with my family—that was interesting. Even so, jumping from apprentice deviled egg maker to Master Sommelier is quite a leap. What changed everything for me was C-CAP [the Careers Through Culinary Arts Program]. They host culinary competitions and give cooking school scholarships to inner-city kids. And I won the final. In one year I went from being this troubled kid to winning a full ride to the Culinary Institute of America. When I met Andy Myers, who was the sommelier at CityZen in Washington, DC. I was waiting tables, and Andy would grab me after service and we’d blind-taste till 3 in the morning. I was learning so much: It was like, game on. What was the best lesson he taught you? Andy was big into Chenin Blanc. One Tuesday he opened this Coteaux du Layon, and I remember him saying, “This is good, but it’s going to be great after three days in the fridge.” I thought, Is this guy insane? How could a bottle of wine be better after three days? Three days later he grabbed me and said, “Here, taste this.” I didn’t even know it was the same wine, and I was like, “Oh, my God—what is this?” It was gorgeous. He’d just stuck a cork in it and chucked it in the fridge. It was the coolest thing. At The Little Nell, you get a lot of wine collectors as customers. What are they after right now in terms of high-end wines? More northern Rhône wines. That’s amazing. Take Monier Perréol, this tiny little producer in Saint-Joseph—I love pouring that by the glass. A few years ago no one would have had a clue what it was. But people want more elegant, more complex wines now. What about Bordeaux and Burgundy? The market is flooded with old Bordeaux. I mean, do you want a case of ’61 Lafite? I can get it for you within two hours. People think old Bordeaux is rare, and it’s not. The collectors I see aren’t looking for Bordeaux; they want Burgundy, Rhône, Barolo, northern Italian. And Burgundy’s great, but look, in a few years the words reasonably priced and Burgundy won’t even fit in the same paragraph anymore. Old California Cabernet. I got an offer two weeks ago for 10 cases of old Diamond Creek, for $100 a bottle. These were early-’80s wines, and they’re beautiful. You can find even better deals than that. On the auction market, for $50 or $60 a bottle, you can drink really well. Incredible wines, subtle in a way that a lot of Napa Cab isn’t right now, already aged, and they’re gorgeous. 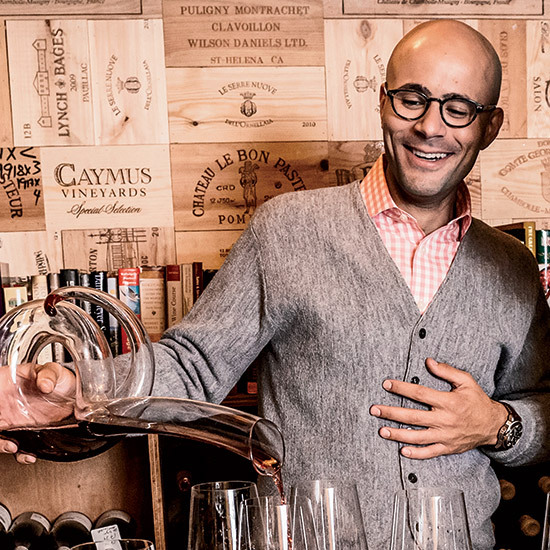 Master Sommeliers are supposed to be infallible, but have you ever had anything go horribly wrong while you were on the floor? I’m extremely clumsy. I seem put together, but I’m not. And this one big New York collector was in here drinking two bottles of ’05 Meursault-Perrières, a Coche-Dury and a Roulot. Together, those wines cost about $1,500. I was running around, it was really hectic, and I poured the wrong wine into the wrong half-full glass. What did you do? Or, maybe I should ask, what did he do? I could have freaked out, but what I did was I stopped, looked at him and said, “OK, that’s now the single most expensive village Meursault ever made.” The guy could have totally told me to go screw myself. But he laughed, chucked the glass out and said, “OK, let’s start over.” It could have been a disaster. But people read off your energy. It’s like when a child falls down. If you cry, they cry. But if you laugh, they laugh, too. At least that’s what you hope for. Carlton McCoy recommends great wines to seek out.